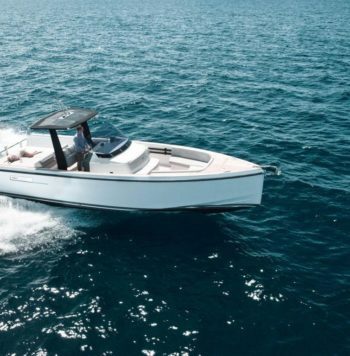 The Fjord 44 Open is the star of the Fjord Range. 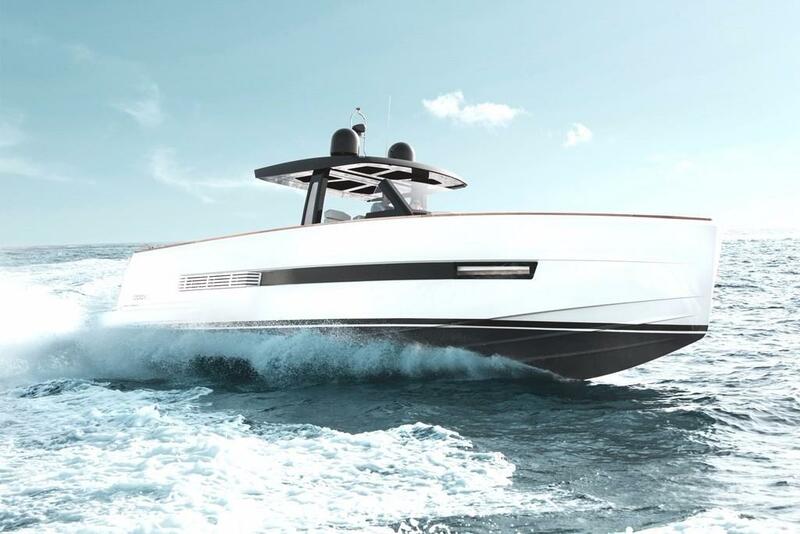 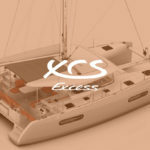 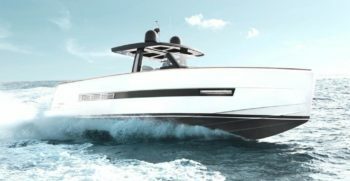 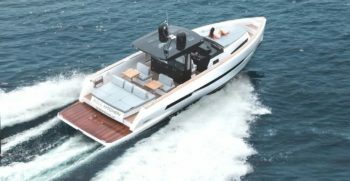 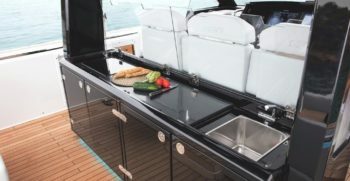 This is principally due to the fact that it provides solutions that its predecessor, the Fjord 40 yacht could not offer. 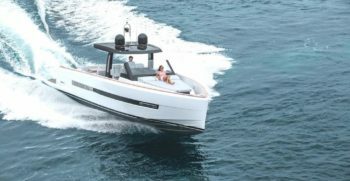 The Fjord 40 Open was and is a great success, however the Fjord 44 open has enhanced and perfected the day cruiser virtues of this yacht. 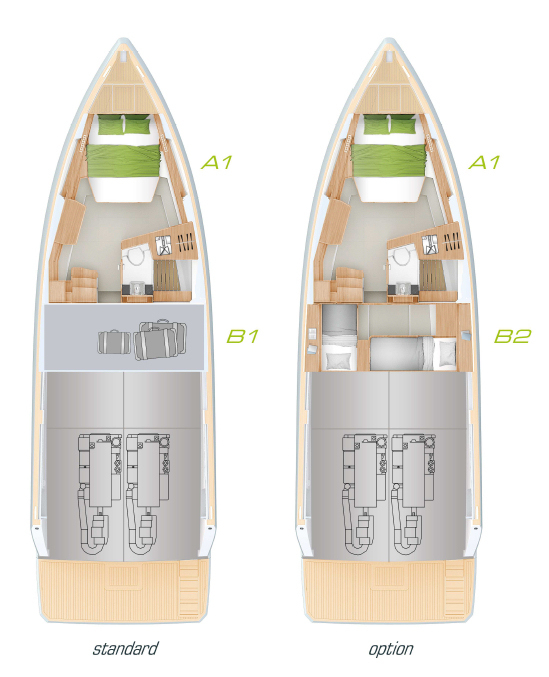 Once again Fjord has had the privilege of counting on the invaluable design of Patrick Banfield. 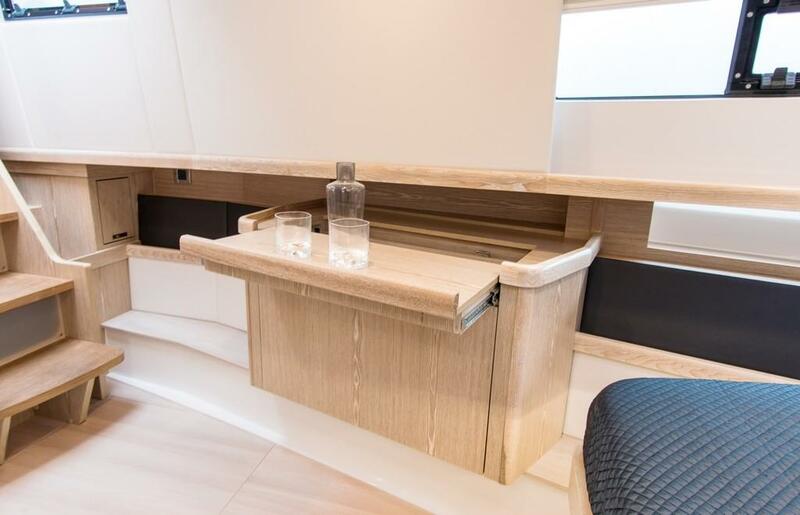 The success is such that many other shipyards have caught on to the Hanse tendency and are trying to emulate our Fjord 44 even to the smallest details. 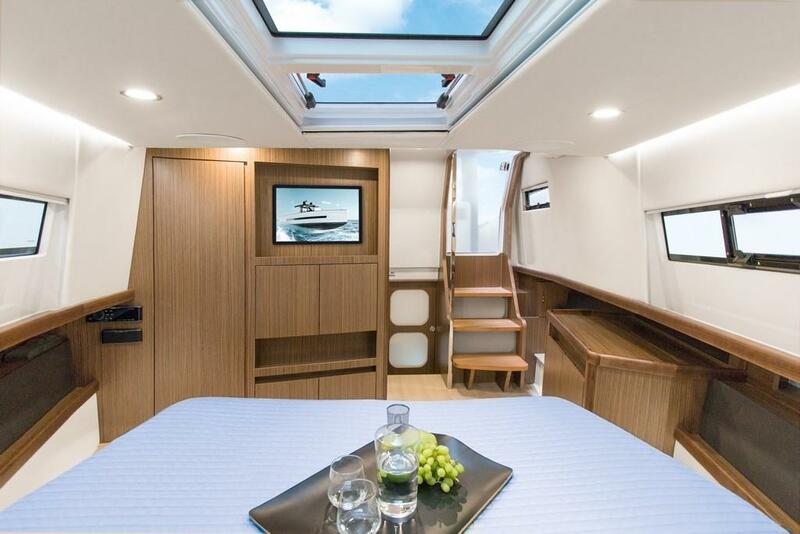 This model retains the distinctive Fjord DNA and transmits originality in every detail. 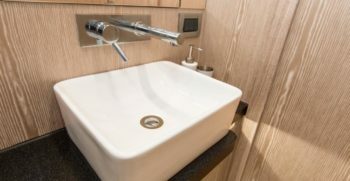 After a decade of development Fjord has reached the level of excellence in design. 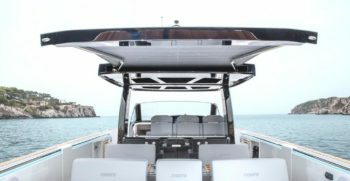 With a total length just 80 cm longer and 25cm beamier than the Fjord 40’, the Fjord 44 open offers a series of significant changes. 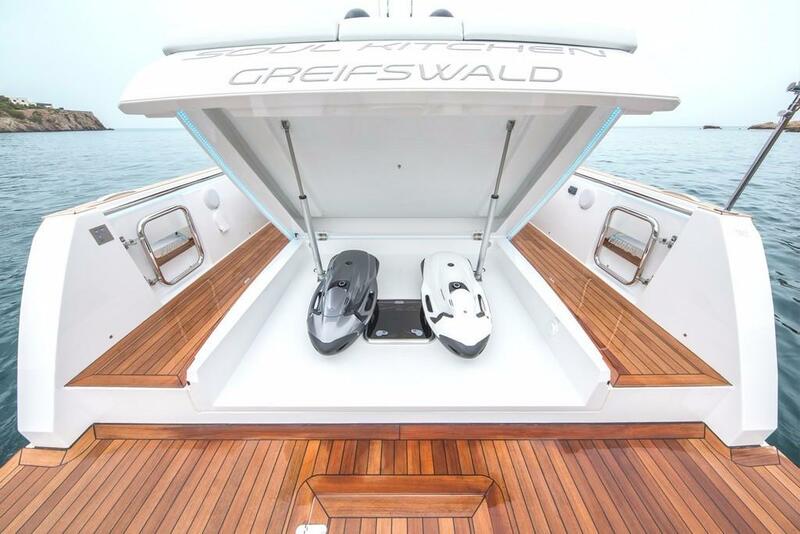 Starting with the extra large hydraulic bathing platform which enables you to carry a Williams Minijet or a Seadoo Spark weighing up to 300Kgs. 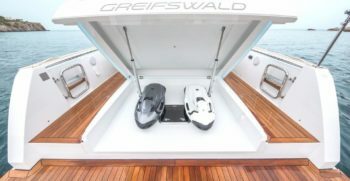 The stairs which are built into the platform unfold to offer comfortable steps communicating the submerged platform with the main deck. 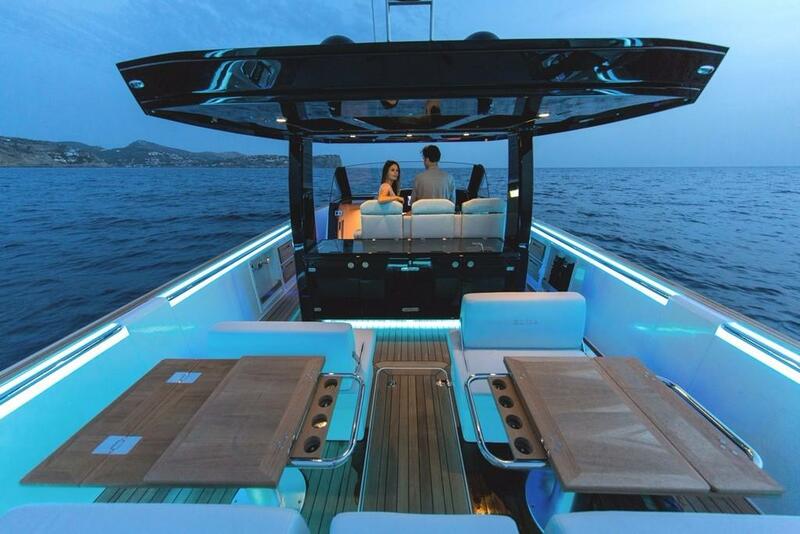 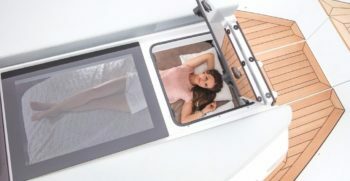 Another major feature of the boat is the Sunbed which is separate from the seating. 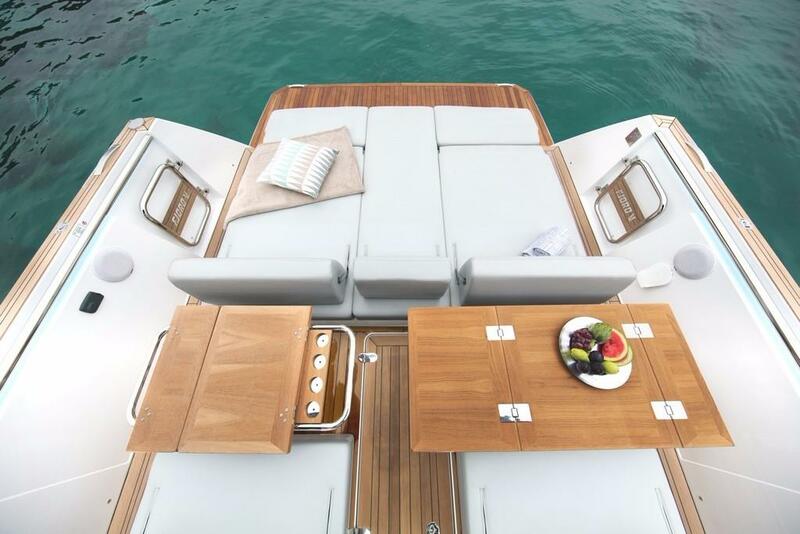 This new lay out permits the seating area and sun bed to be used simultaneously. 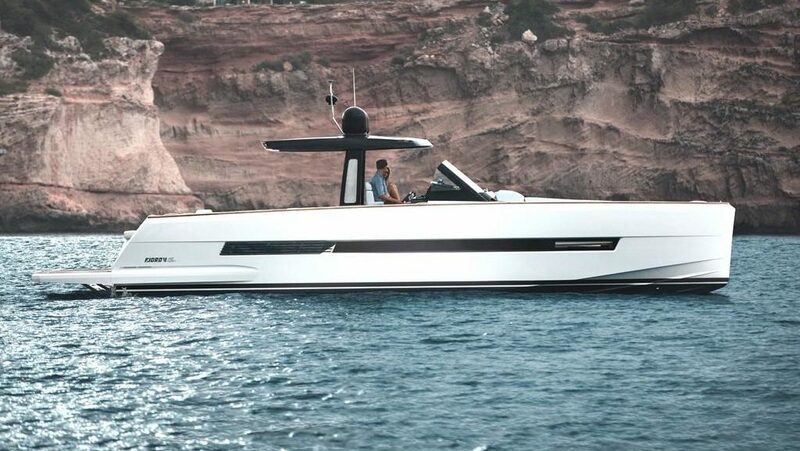 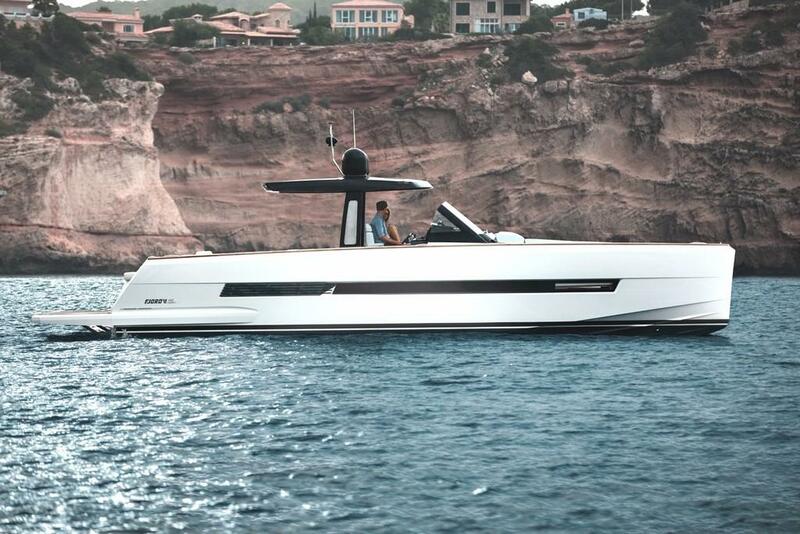 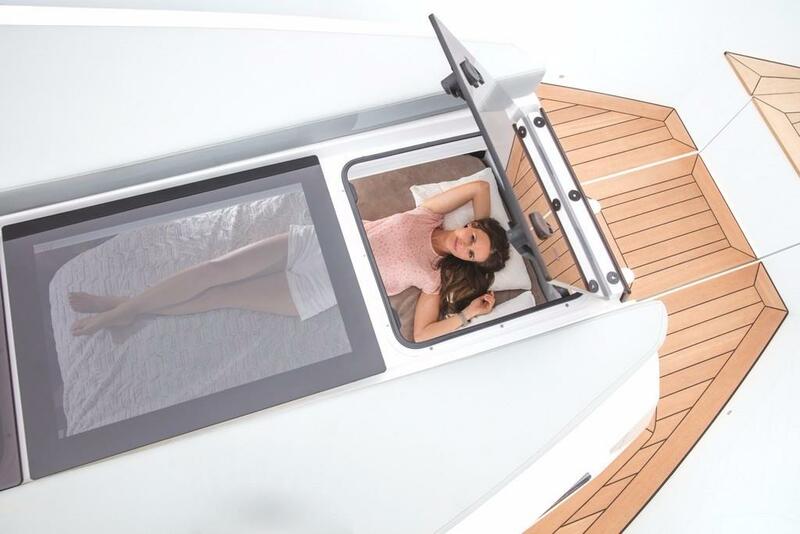 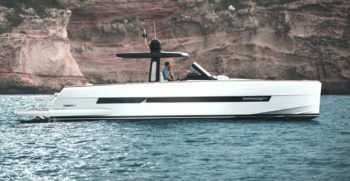 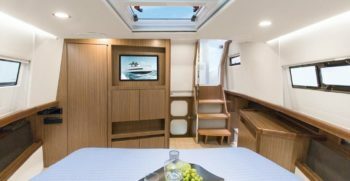 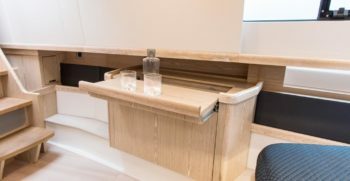 The yacht also accommodates a large storage area accessible by means of a hydraulic hatch under the rear sunbed where you can store all your toys. 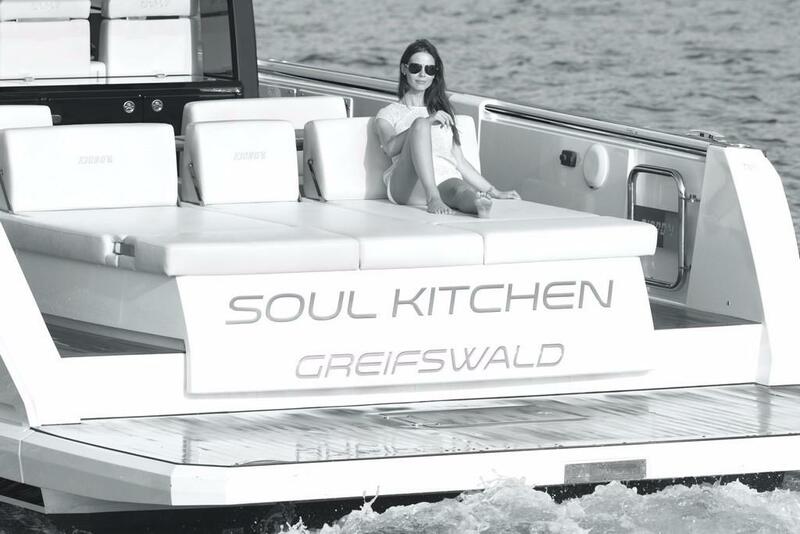 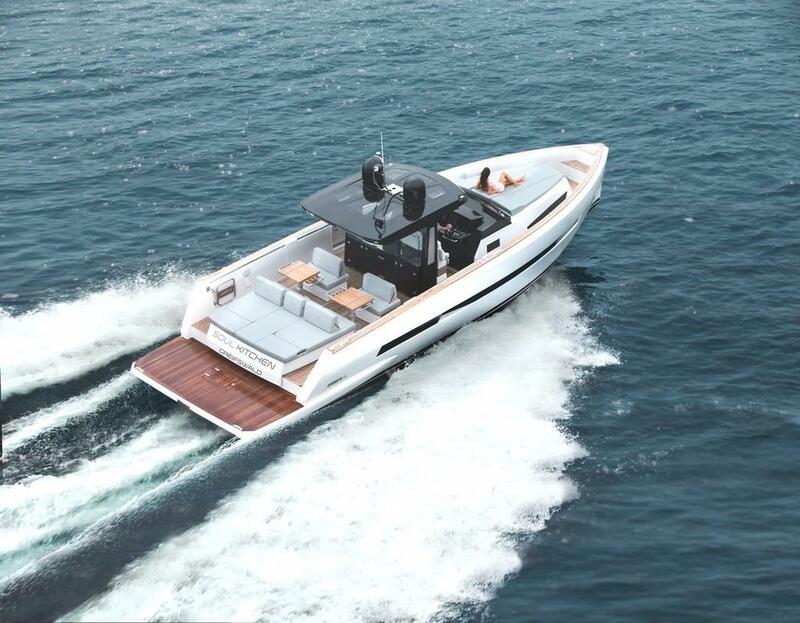 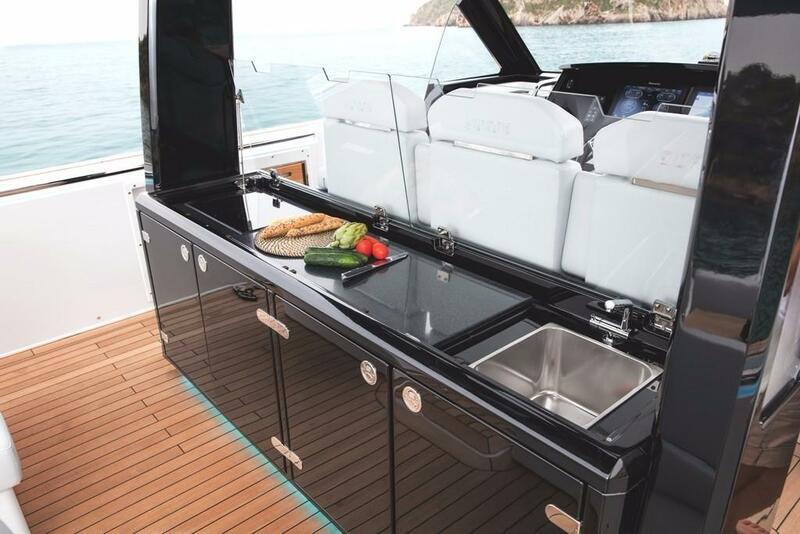 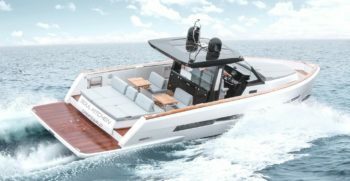 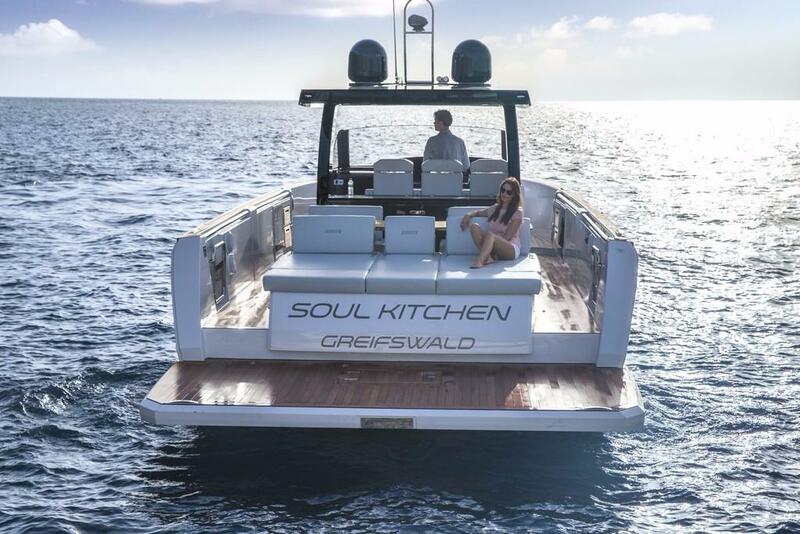 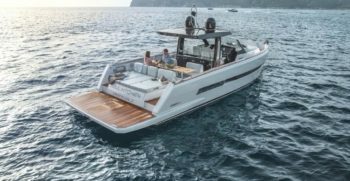 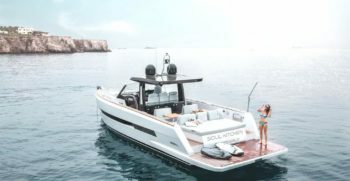 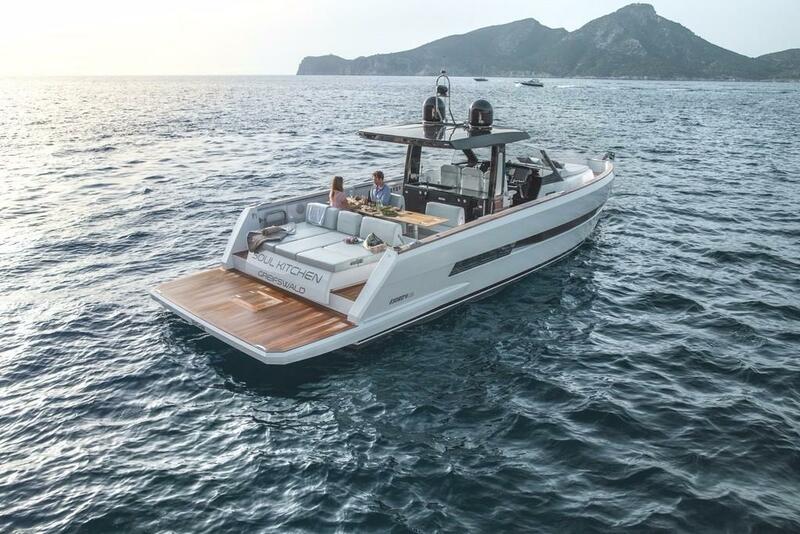 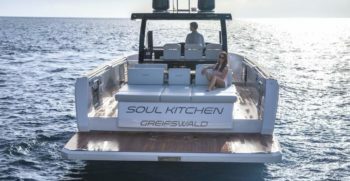 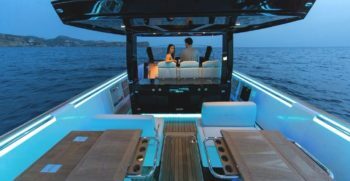 The Galley module offers a larger work surface compared to the Fjord 40 open and the electric Bimini unfolds covering the dining area swiftly. 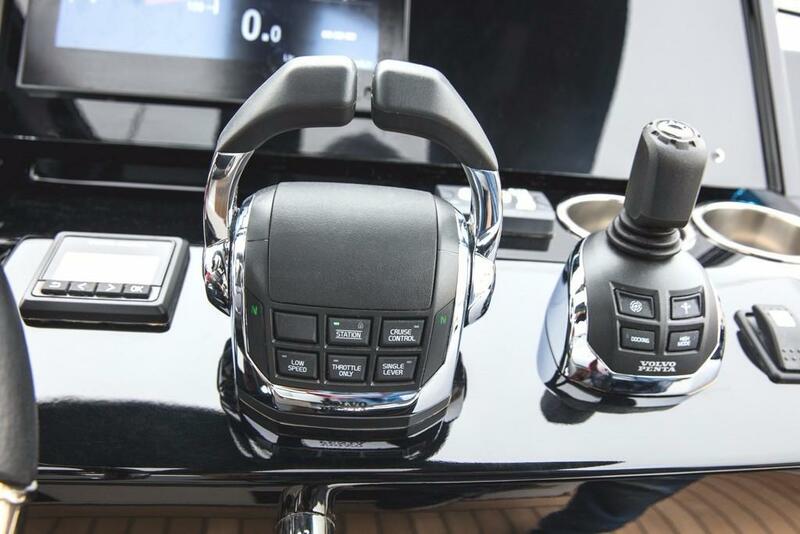 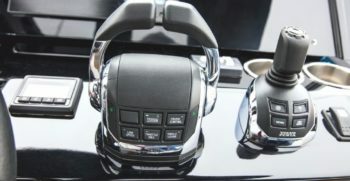 The console and driver seats are protected by a Glass Windscreen which can also be equipped with Wipers. 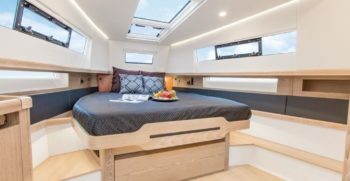 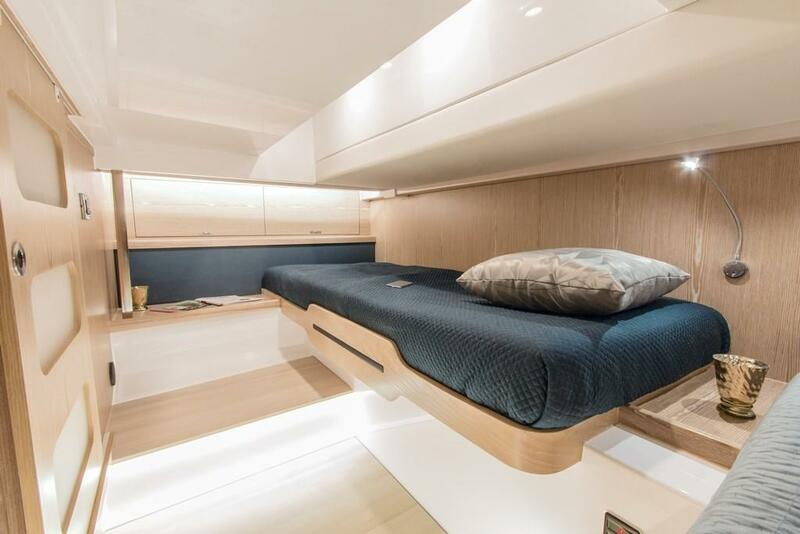 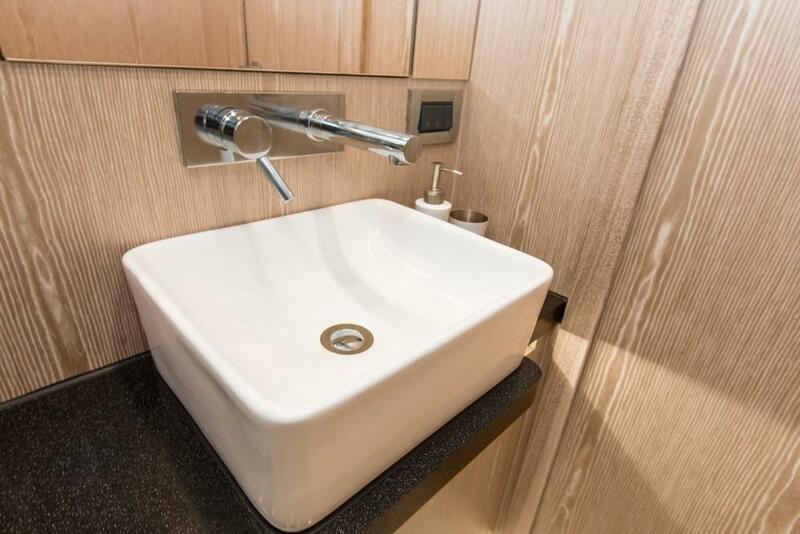 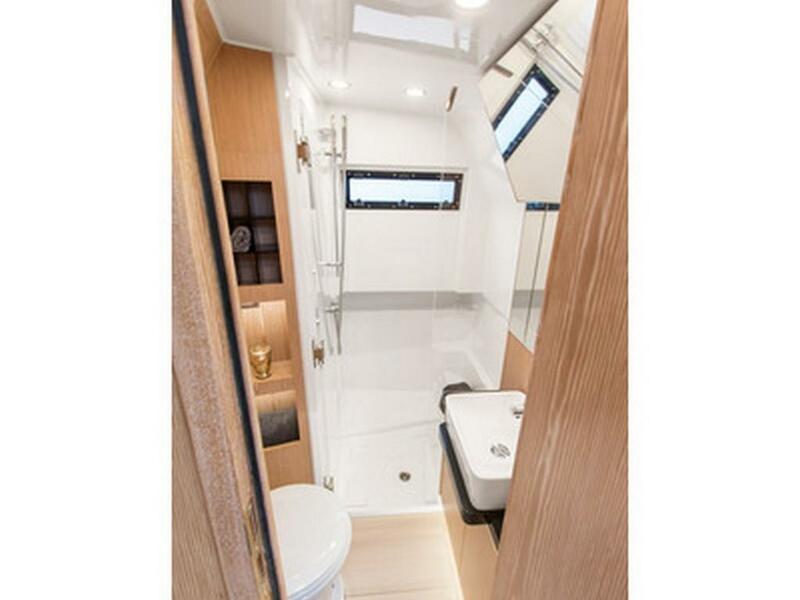 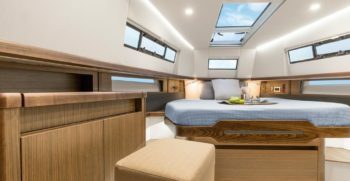 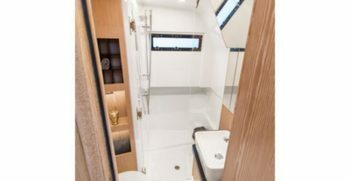 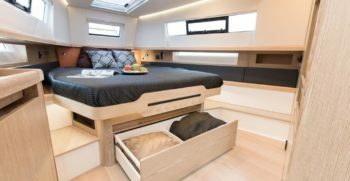 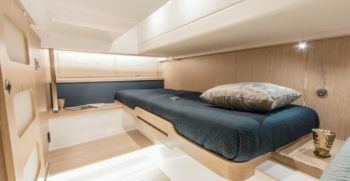 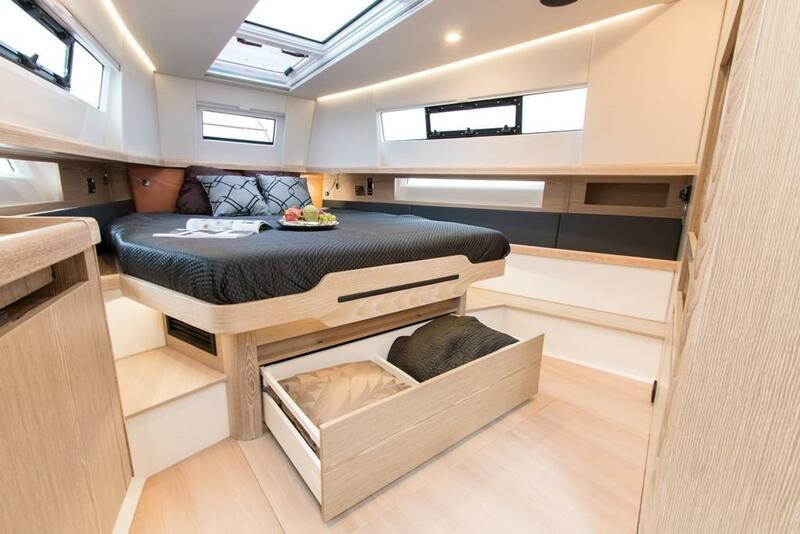 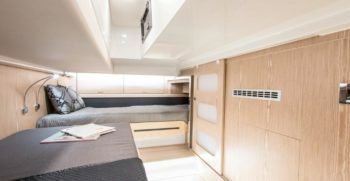 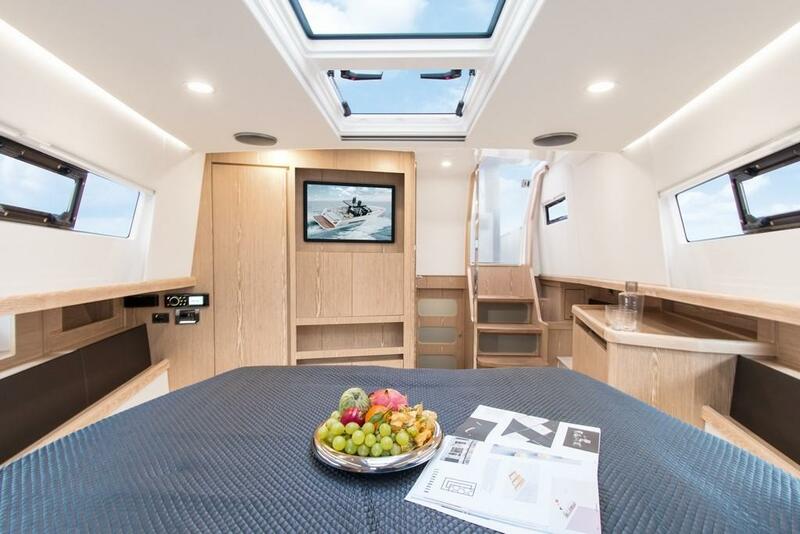 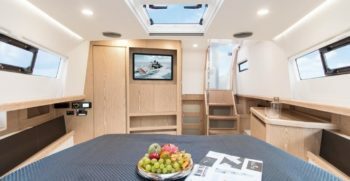 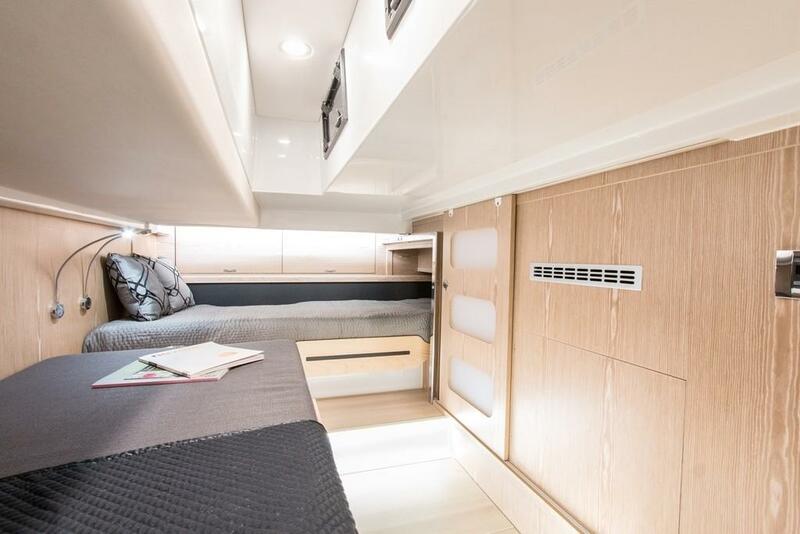 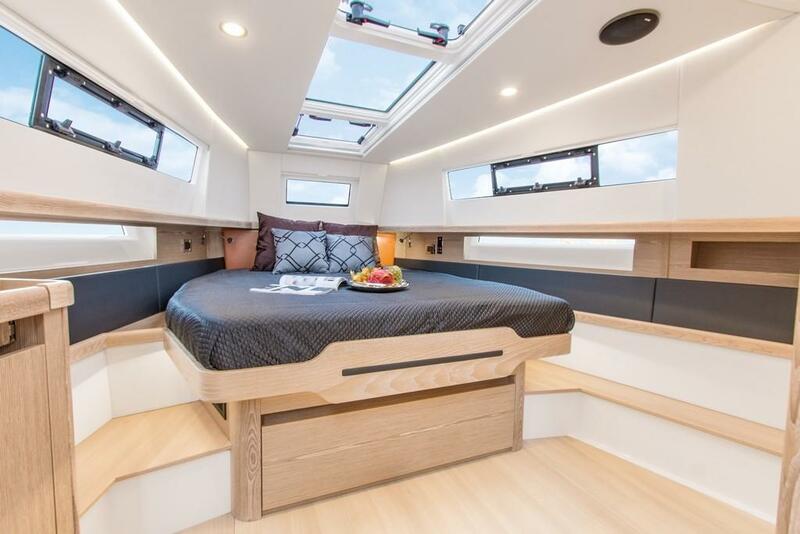 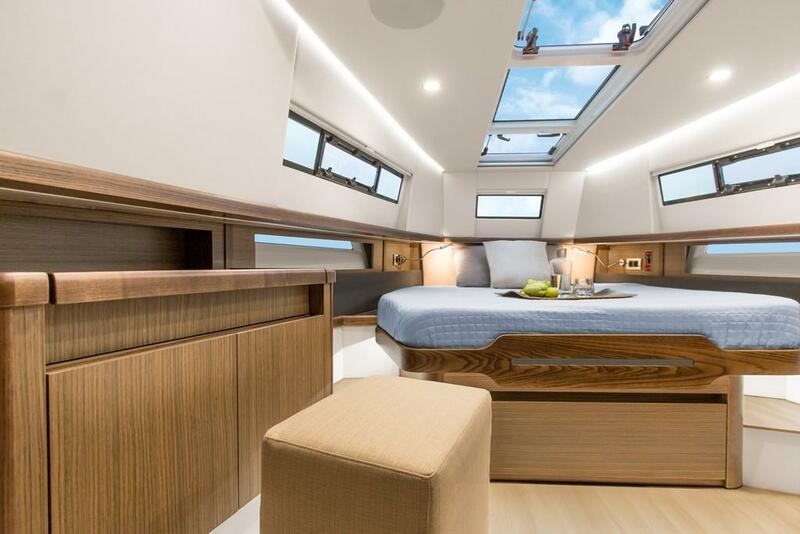 Finally, the Fjord 44 Open has included a second cabin with two separate beds and have fitted out the bathroom with a separate shower cabin. 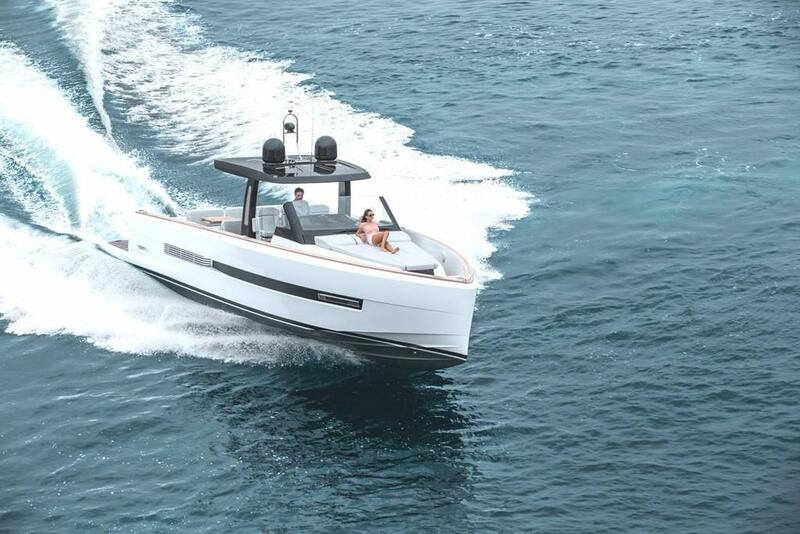 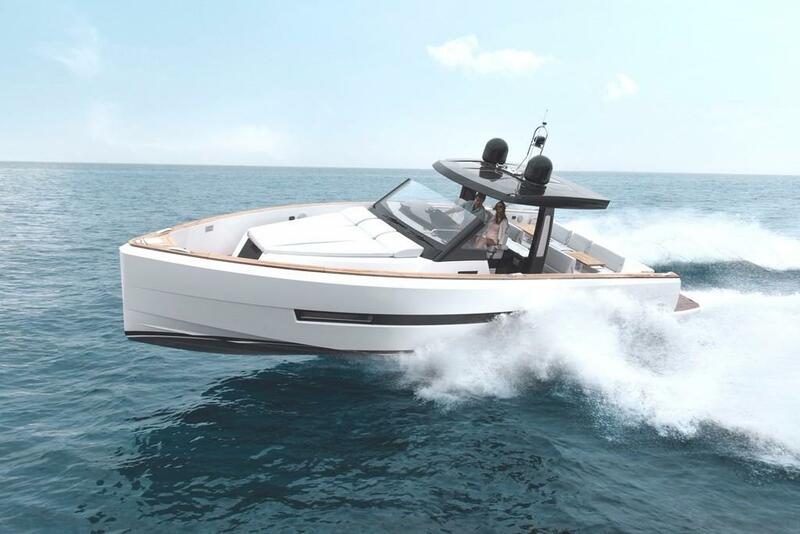 The Fjord 44 open has become the ideal boat of its size for day cruising. 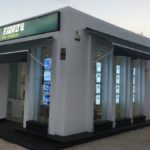 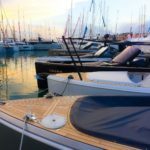 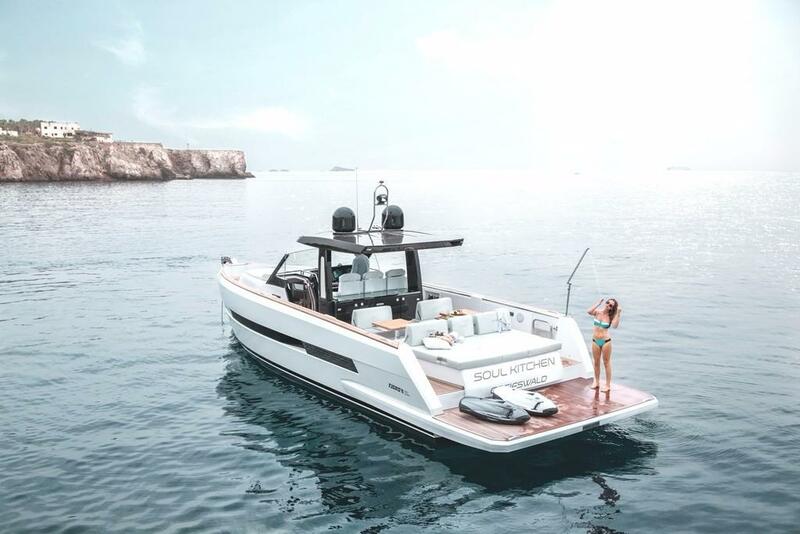 It is very appreciated by Yacht owners with Real Estate on the Coast and those who have previously owned large Yachts with multiple cabins and wish to return to the simplicity of day boating. 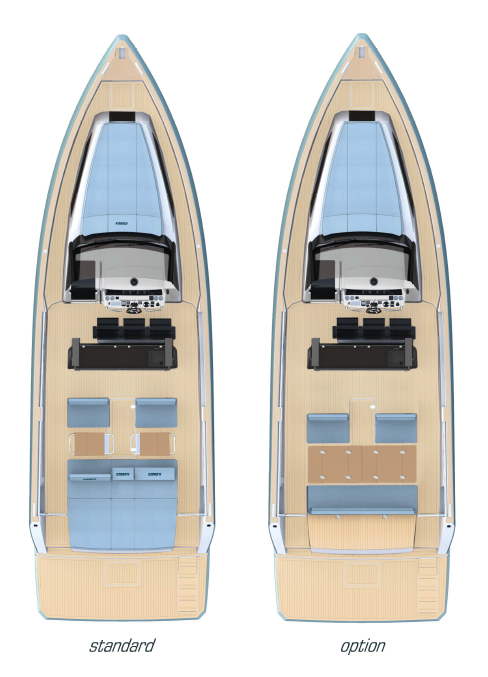 The extensive Deck space with a complete, wide walk around and central console offer great safety to all passengers. 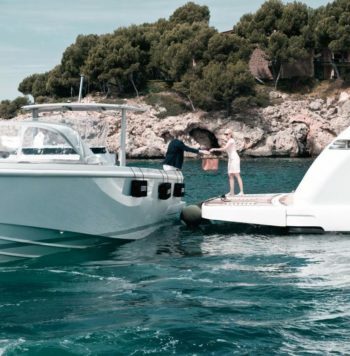 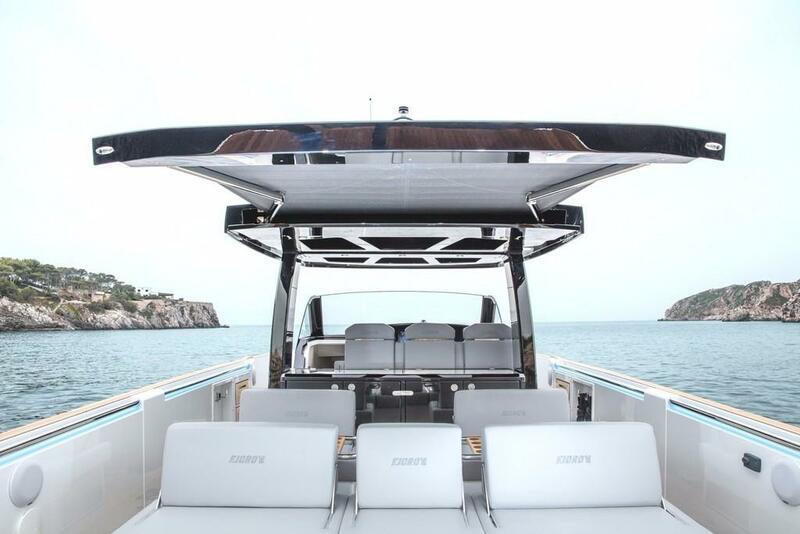 The high freeboard avoids sea water and spray from splashing the windscreen which gives you an added sensation of safety and well-being on board the boat. 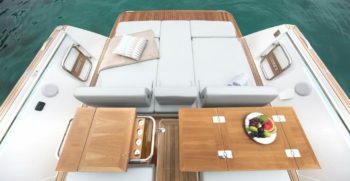 The handling of this Fjord inside the port is easy and very precise due to the Joy Stick Steering System of the yacht. 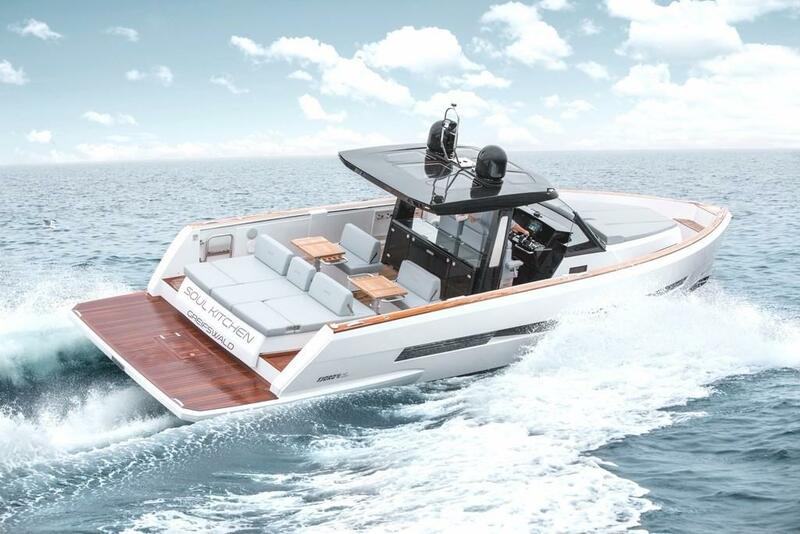 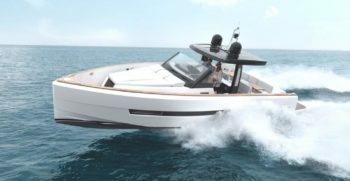 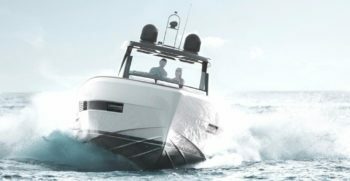 You have a choice of two engine powers, the Volvo Penta IPS 500 with 370Hp output and the IPS 600 with 435HP both engines are based on the Volvo D 6 engine. 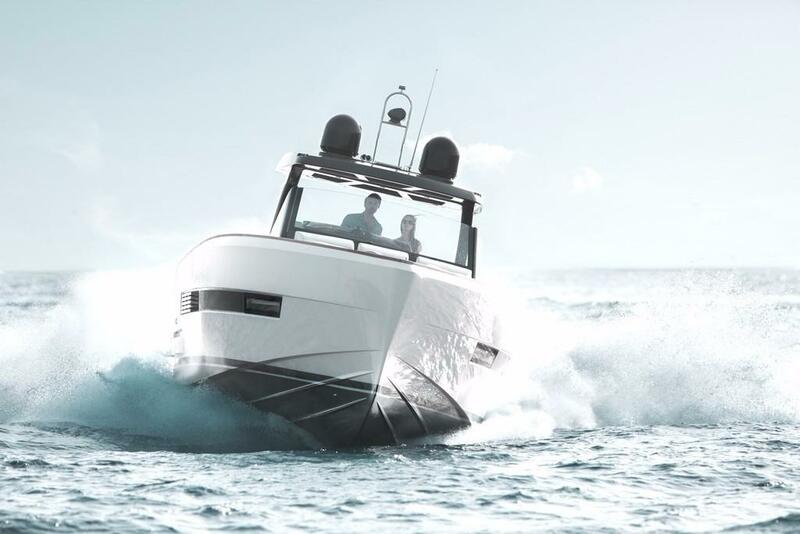 Volvo Penta with IPS drives are renowned for low fuel consumption and superb performance.